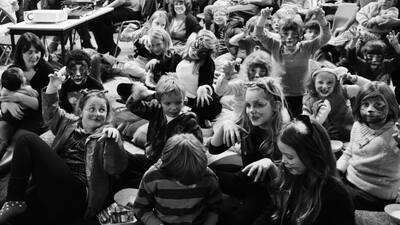 Handmade Cinema is an award winning community cinema that transforms the way you watch film. We screen classic films in immersive environments and host film-related workshops, allowing family audiences to interact with film in a more engaging way. With craft activities, decorated environments, live music, themed food and interactive workshops, Handmade Cinema screenings shun traditional one-dimensional cinema experiences and transform familiar films, such as The Jungle Book, Fantastic Mr Fox, Chicken Run, Mean Girls, Muppet’s Christmas Carol and many more. In order to reach different communities, the Handmade Cinema team take portable screening equipment from venue to venue, presenting events at places as varied as Longshaw Estate, Burngreave Scout Hut, The Montgomery Theatre and Walkley Community Centre. Ahead of the final screening, community groups have the opportunity to explore the film’s themes and ideas through Handmade Cinema workshops involving crafts, filmmaking, creative writing, photography, pottery, drawing and more. Handmade Cinema is a founding member of Girl Gang, a creative collective celebrating women and hosting film screenings amongst other events. Girl Gang Sheffield’s screening of Mean Girls won a Cinema For All Award for Best Single Event.